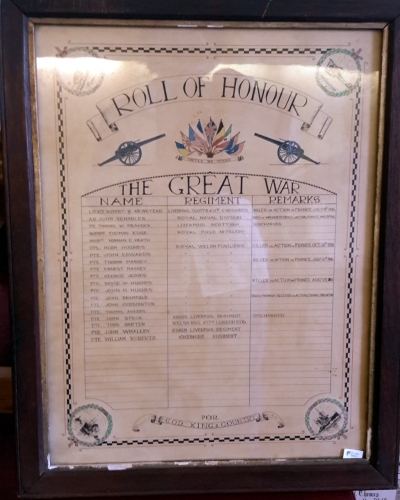 I found these men when I was on the Imperial War Museum – Memorials Project website (http://www.iwm.org.uk/memorials/item/memorial/38064) and found that the Flintshire Record Office at Hawarden had a WW1 Roll of Honour from the Queensferry Chemical Works. When I saw the names there were 2 men I did not recognize as being on any local Memorial, Rupert Randolph Newstead, and also Hugh Hughes, please click on the links below to read their stories, but the others who died are on other memorials and their stories can be seen on the Roll of Honour below, just click on their names and it will take you to the memorial, they are remembered on. Framed and glazed list of the men who were in the war and from the factory. Some of them were among the “Fallen” but most survived. Pte. William ROBERTS – Cheshire Regt.